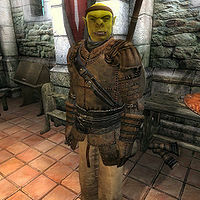 Urbul gro-Orkulg is an Orc smith and the proprietor of Slash 'N Smash in the Market District of the Imperial City. He sells blunt weapons and offers repair services. Being a merchant in the big city suits Urbul just fine, even if it means tons of hard work and very little spare time. He sleeps in the Living Quarters above the shop every night between midnight and 6am and starts the day with a two-hour breakfast in one of the chairs in the main trading room. At 8am, he opens up Slash 'N Smash for customers and proceeds to offer his services until his usual closing time at 8pm. He then takes a walk down to The Feed Bag where he eats dinner and hangs out with the merchants and regulars there. At midnight, he heads back to his shop and goes to bed. On Loredas and Sundas, he skips dinner and adds an additional four hours to his regular opening time, offering his services until midnight. He wields a steel battle axe and his choice in armor includes a leather cuirass and gauntlets. Additionally, he wears a pair of light brown linens and thick cowhide shoes. He carries around the key to his shop and a large sum of gold. Urbul always thinks "big" and will greet you like this: "Urbul gro-Orkulg knows you NEED axes and blunt weapons. BIG ones. So he makes them and sells them here... Slash 'N Smash... the BIG Orc Weapon Shop. BIG weapons. For BIG heroes." And he knows perfectly well, why he chose to settle down in the Imperial City: "Where else? You have to be here. This is THE City. The BIG City. Why waste time in little places?" His size fixation has not escaped the notice of other Imperial City residents, and they will comment that "No real question what Urbul is going for there. He's got weapons. Big weapons", "Urbul keeps a lot of axes and maces. He seems to like big weapons", and that "Lots of big weapons there. Urbul always has some in stock." Of his store, they will add "It's an apt name. He's got big maces and big axes. Urbul is a big fan of killing things thoroughly." The longer weekend opening hours are caused by Urbul not having a default AI package. During the week, he eats from 8pm until midnight but he has no AI package for those hours at the weekend, so he keeps performing the previous package and thus his store stays open. Esta página foi modificada pela última vez à(s) 17h37min de 27 de maio de 2013.